(Kansas City, Mo. – Oct. 19, 2015) For the first time, Kansas City now has a single website dedicated to public transportation in the metro area. 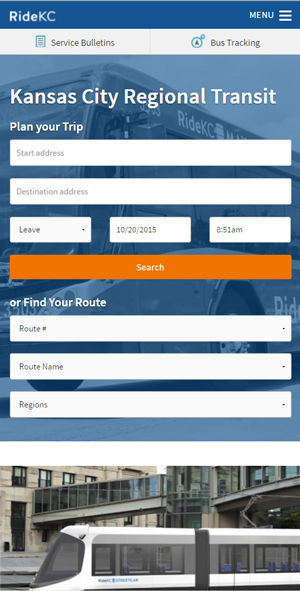 No more culling through multiple websites to find bus service in Kansas City. 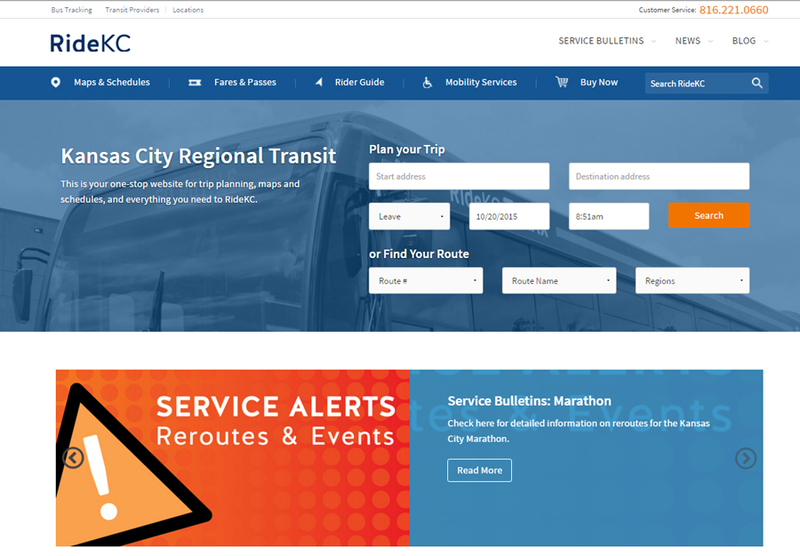 The new RideKC website, which was launched Oct. 15, gives bus riders one location to find information about routes, schedules and fares for every corner of the Kansas City region, whether it’s downtown Kansas City, Johnson County, Wyandotte County or Independence. The new website – ridekc.org – is part of a regional effort to create one seamless transit system that easily connects people to opportunity regardless of where they live. It’s part of an ongoing regional effort to bring the area’s transit systems together under one tent, including rebranding all of the region’s buses and moving to a simpler fare structure. Until now, bus riders wanting to learn about schedules and routes across the Kansas City area had to visit different websites to learn about routes, schedules and fares for transit agencies in Kansas City, Johnson County, Wyandotte County and Independence. Now, RideKC will offer one source for all things transit, including service bulletins, outlets for purchasing bus passes, park-and-ride locations and much, much more. For the first time, riders can find retail bus pass outlets, park-and-ride lots and transit centers geographically across the region. The web site will provide maps and addresses showing where each transit center and park-and-ride lot is located. It also will tell riders what routes serve each transit center and park-and-ride location. Web designers will continue to refine the RideKC site over time. New features added to the site will be announced as they are developed.